BETHLEHEM (Ma’an) — Israeli forces shot and injured a Palestinian with live fire Wednesday morning, as the man was attempting to pass through a gap in Israel’s separation wall in the occupied West Bank to go to work in Jerusalem. 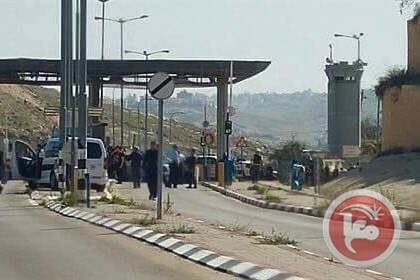 Witnesses said that Israeli forces opened fire on the man in the Wadi Abu al-Hummus area, near Israel’s Mazmuriya military checkpoint east of Bethlehem in the southern occupied West Bank. The Palestinian Red Crescent said they received the man, suffering from a gunshot wound in his left thigh, from Israeli forces who were heavily deployed at the checkpoint. He was evacuated to the Beit Jala Governmental Hospital for treatment, where his injury was described as moderate. The Palestinian Red Crescent identified him as 27-year-old Ahmad Radaideh, from the town of al-Ubeidiya east of Bethlehem. Palestinian residents of the West Bank are not allowed to access occupied East Jerusalem or Israel without an Israel-issued permit, and many risk being shot and injured while trying to cross into Israel to work.